Let's be honest. Most of the time when we make those elaborate little chocolate do-thingy's for Valentine's Day, like chocolate dipped strawberries and fudgey cupcakes drizzled with glaze and heart-shaped candies, or some other sickly-sweet confection dyed a disturbing shade of bright red, we're not really making them for our partners. Sometimes we're not even making them for our kids. Truthfully, if you happen to be making them for a man most of them don't really care how pretty those chocolates are. If you're making them for a kid, they're just going to gobble them up regardless. Unless your partner happens to really appreciate your decorating abilities, the reality is we're making those things FOR OURSELVES. Sometimes it's ego, sometimes we want a really beautiful photo for a blog or facebook, sometimes we want to be able to tell others how awesome our creation was. Sometimes we just want to be able to sink our teeth into something pink and sweet. Well this year I'm not going to waste time decorating, or even planning. I'm making my husband something I know he'll appreciate. Gluten Free Chocolate Beer Cake. Yup. I went there. And gentlemen, Happy Valentine's Day. You're welcome. My husband is a beer lover. And he's got no issues with gluten. But he's not into the light, lawnmower type of beer that college guys drink like 24 of in a night. He likes stouts, and micro-brews and if it's a choice between anything Lite or Guinness... well there's no choice at all, really, the Guinness goes without saying. As such, he is my go-to taster when it comes to testing out gluten free beers. Also as a beer-lover, he loves things made with beer, like Guinness stout stew, and beer pot pie. So for this Hallmark-manufactured holiday that is, generally, a big fat waste of money that just causes anxiety, distress, resentment and feelings of disappointed expectations, I'm working on creating some gluten free recipes using gluten free beer, including this gluten / wheat-free chocolate cake and a gluten free root veggie beer stew. Yes my husband loves beer, and he loves chocolate cake. But neither of us wanted something unhealthy. When I searched around for normal beer cake recipes, I found that most of them had a ridiculous amount of sugar and butter. 1 cup of butter and 2 cups of sugar seemed pretty standard. 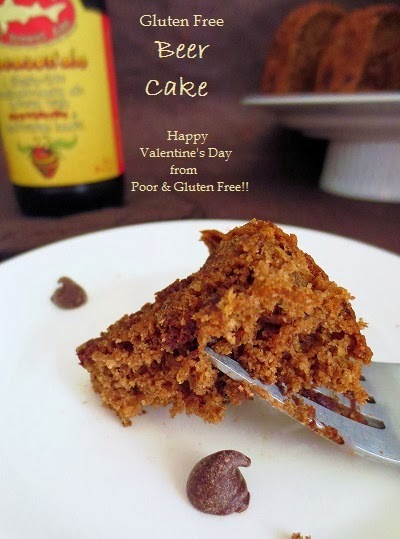 So I took the basic recipe for the Gluten Free Chocolate Applesauce Cake that I created for my cookbook, Living with Oral Allergy Syndrome and modified it to make the light, moist, low-fat, low-sugar, healthy beer cake you see in these photos. The sugar and butter have been drastically reduced and mostly replaced with applesauce and beer! And while I'm at it, I might as well take the time to give you a quick review of the gluten free beer I used to make this particular cake. * Green's Belgian Ale - the link takes you to a site with a description of the 4 different GF beers Green's makes, and if you go to the top menu Find Our Beer, it will help you find a retailer near you. In particular I like the Endeavour Dubbel Dark Ale, which is the closest I've come to a good strong stout in a gluten free beer. My husband and I have been known to share one of these from time to time because they are LARGE bottles. 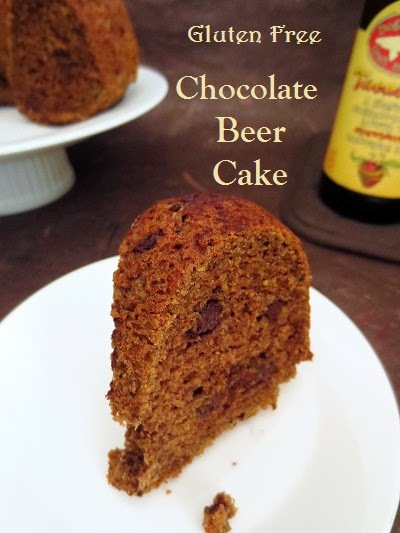 I've used this before to make this beer cake and it's very good. - note that Green's is made with some buckwheat. If you have Oral Allergy Syndrome and are allergic to buckwheat you may have a problem with this. I'm allergic to buckwheat and can't have buckwheat grouts, but can have Green's with no problems. I presume this is because of the processing. * Bard's - a US beer brewed with Sorghum malt, Bard's is one of the first GF beers I encountered, and find it to be a pretty solid beer. My husband has been known to pull one of these out of the fridge himself. There are, of course, other GF beers out there, but when it comes to baking or cooking I think it's best to use one with a deep flavour, such as these two. And then entered Dogfish Head's Tweason' Ale. This is a new one for me. Last week when hubby was off to the liquor store I asked him to grab me a case of GF beer, assuming they'd have Bard's like they normally do. Instead, he came home with this pretty yellow and red 4 pack of beer. As you can see, it's a sorghum based ale made with strawberries and buckwheat honey, made in the US. I was super excited (yet hesitant - keep reading) to see that someone finally decided to make a micro-brew type flavoured beer that wasn't just trying to be a gluten free knock-off of another beer. Does it actually taste like strawberries? You might be wondering. Yes. I'm going to say that there is definitely a strawberry undertone. My husband suggested it might be similar to a Belgium-style fruit beer. I think it's quite a nice ale, and I appreciate that it's made with simple ingredients, and not corn syrup the way that some GF beers are. This is a sitting out on the front lawn in the summertime type of beer, not a bland lawnmower beer. And ultimately, despite my hesitations about how it would taste in a chocolate beer cake, it actually held up well to cocoa and baking. If anything, it may have even provided a slightly fruity flavour. 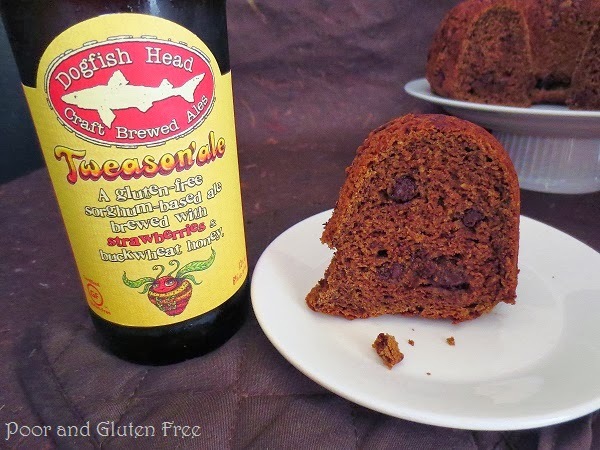 Now that the gluten free beer reviews are out of the way, let's move on to that fine-looking chocolate beer cake. 1. Whisk together butter, eggs, sugar, and stevia until fluffy. Add in beer, applesauce, cider vinegar, and vanilla and blend gently (you don't want the beer to foam up). 2. In a medium-sized bowl, sift together all dry ingredients, except chocolate chips. 3. Fold dry ingredients into liquid and blend until smooth. Then fold in chocolate chips. Pour into the Bundt pan and smooth the top with a wet spatula. 4. Bake for 35-40 minutes, until a toothpick inserted in the center comes out clean. Tap Bundt pan over a cooling rack to pop out cake and let cool 10 minutes before cutting (otherwise the texture will be too squishy). Now I didn't frost the cake because my husband doesn't like frosting and we wanted a cake we wouldn't feel guilty about eating. If, however, you want to frost it, from what I gather you can use any basic chocolate frosting recipe and just use beer instead of milk/water as your liquid. Have you ever baked or cooked with gluten free beer? I do love using beers that have fruity undertones - and they would be perfect for baking. Your cake looks amazing - it's wonderful it's gluten free as well! Thank you for sharing it with us at the Hearth and Soul hop. I am always up for chocolate cake and this delicious recipe with vegan options is perfect for my diet. It's always a pleasure to explore your blog. Thank you so much for sharing this helpful post on the Healthy, Happy, Green & Natural Blog Hop! I appreciate it! Buenìsima receta sin gluten tentadora y muy linda versiòn,saludos y abrazos.